2 Department of Mental Health, Psilocybe Inc.
© Miyamoto and Sono; Licensee Bentham Open. We conducted a comprehensive narrative review and used a systematic search strategy to identify studies related to peer support among adults with mental health difficulties. The purposes of this review were to describe the principles, effects and benefits of peer support documented in the published literature, to discuss challenging aspects of peer support and to investigate lessons from peer support. Fifty-one studies, including 8 review articles and 19 qualitative studies, met the inclusion criteria for this review. Most of the challenges for peer support were related to “role” and “relationship” issues; that is, how peer support providers relate to people who receive peer support and how peer support providers are treated in the system. The knowledge gained from peer support relationships, such as mutual responsibility and interdependence, might be a clue toward redefining the helper-helper relationship as well as the concepts of help and support. Keywords: Benefit, Effect, Mental Health, Mutuality, Peer Support, Principle, Reciprocity, Relationship. Health care professionals need to relate to us that they have their own struggles and own that change is hard for all. They need to look at our willingness to “recover” and not perpetuate the myth that there is a big difference between themselves and people they work with. Support then becomes truly a mutual phenomenon where the relationship itself becomes a framework in which both people feel supported in challenging themselves. The desire to change is nurtured through the relationship, not dictated by one person’s plan for another. The outcome is that people don’t continue to feel separate, different, and alone. S Mead and ME Copeland  (p.320-321). Since the early 1990s, opportunities for the provision and receipt of peer support within the mental health system have proliferated rapidly across the United States as part of the emerging recovery movement . Peer support has been recognized as an essential component of a supportive network for persons with severe mental illness  and the empirical base of studies of peer delivered services has grown . However, the concept of peer support is broad, and the definitions, effects, outcomes and benefits of peer support are varied. While some prior reviews have focused on the effects or benefits of peer support, most of these reviews have not focused on the challenging areas of peer support. The purpose of this review is to describe the principles, effects and benefits of peer support, as documented in the published literature. Moreover, we discuss the challenging aspects of peer support and their lessons. Relating to mental health and psychiatric illnesses (mental health OR psychiatr*). Studies were included if they aimed to provide support by and for adults with mental health difficulties. “Mental health difficulties” was broadly interpreted to include specific problems, such as depression or anxiety, as well as more vaguely defined problems, such as ‘‘chronic mental illness.’’ We included only face-to-face peer support and excluded support provided only via the internet or the telephone. Studies were excluded if the peer support group consisted of people from the same profession and/or the same workplace (e.g., groups of firefighters, police officers, nurses or general practitioners). Support limited to adolescents and children, criminal justice (including victims), bereavement and women were also excluded. Substance misuse and addictions were excluded (including dual diagnosis) because this is a distinct specialty with its own large body of self-help literature . Groups for caregivers (e.g., relatives of people with dementia or families of people with serious mental illness) were also excluded because they focus on reducing caregivers’ stress or burden. Abstracts and articles were examined for relevance to the research question. One hundred thirty-eight articles that met the criteria described above were selected for review. 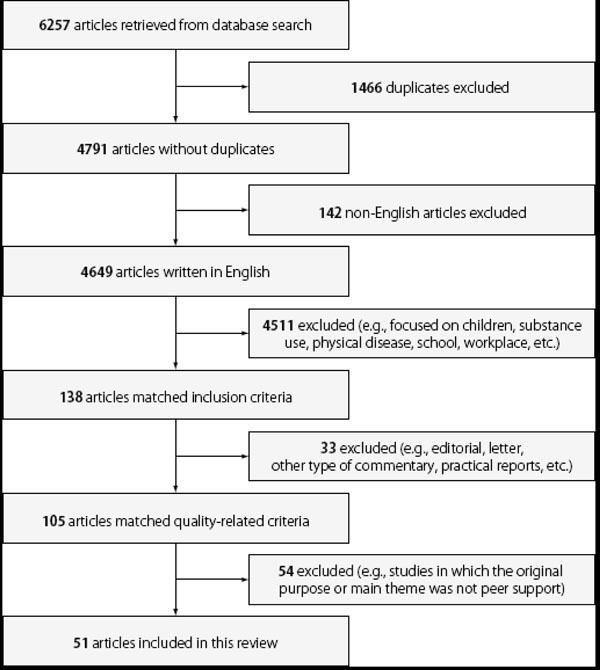 One hundred and five papers selected for inclusion were reviewed in detail for further quality-related criteria, such as original studies (i.e., not an editorial, letter, or other type of commentary) or those that present data (i.e., not just practical reports). We excluded studies for which the original purpose or main theme was not peer support, such as studies that did not evaluate the effect of “peers” but rather examined the effect of programs, such as the Wellness and Recovery Action Plan (WRAP), Health and Recovery Peer (HARP) program, Pathways to Recovery (PTR) [6-8] and other programs including peer-support training. We excluded studies or that focused on operations and structure of peer support programs or instrument development. We also excluded studies that used peer support as one of the predicting variables in a multivariate analysis. Fig. (1) shows that the database search and article selection process resulted in the inclusion of 51 articles in this review. Identification and selection of articles for inclusion in this review. Fifty-one studies, including 8 review articles and 19 qualitative studies, met the inclusion criteria for this review. People who provide peer support were described in many ways: consumer employees, consumer providers, consumer supporters, consumer staffs, peer providers, peers, peer staff, peer supporters, peer support specialists, peer support providers, peer support workers and other terms. Although each term has specific meanings and purposes, we will adopt the expression “peer support providers” to discuss the general idea in this paper. The common themes in review articles were typologies or definitions of peer support, benefits of peer support and the role of the peer support movement [2, 3, 9-13]. A review search strategy was indicated in one review article of the effectiveness of mutual help groups . In our review, we summarize the principles of peer support, the effects of peer support and the challenges of peer support, as demonstrated in the articles. Six of the studies directly mentioned principles of peer support (Table 1), indicating ways that the experiences of or history of mental illness can offer assistance and hope to the people involved in peer support [13-18]. Chinman et al. 2001  (Peer-support principles) suggest that those with mental illnesses will benefit by coming together to provide aid for each other in the context of supportive social relationships. Hodges 2007  Peers who understand what the experience of having a mental illness is like are providing services to their fellow consumers with mental illnesses, despite the differences in operational and organizational structures between these service modalities. Castelein et al. 2008  Peer support is based on the assumption that people who share similar experiences can oﬀer each other emotional, appraisal, and informational support and hope. Sells et al. 2008  Peer staff were individuals who had chosen to publicly disclose their history of mental illness and subsequent recovery, with the intention of using these experiences in concert with their clinical talents and skills to assist clients who were currently dealing with active psychiatric problems. Adame & Leitner 2008  The peer support model is rooted in the belief that signiﬁcant interpersonal relationships and a shared sense of community lay the foundation for the process of healing. Lucksted et al. 2009  (Peer support is) based on the idea that those who have experienced mental illness can offer help and support to others. Solomon & Draine 1994; 1995 [20-22] A randomized trial of a team of case managers who are mental health consumers compared to a team of non-consumers. Recipients of case management (n=94) Case management services delivered by consumers were as effective as those provided by non-consumers (symptomatology; QOL; social contacts; medication compliance; alliances with clients). Clients served by a consumer team were less satisfied with mental health treatment. Felton et al. 1995  An intensive case-management program with peer specialists. Recipients of case management (n=104) Clients served by teams with peer specialists demonstrated greater gains in several areas of QOL and an overall reduction in the number of major life problems experienced. Rivera et al. 2007  Consumer-assisted case management with standard clinic-based care. Recipients of case management or clinic-based care (n=203) There were no significant differences between the consumer-assisted program and other programs in terms of symptoms, satisfaction, subjective QOL, objective ratings of contacts with family or friends, and objective ratings of activities and finances. Lawn et al. 2008  Early discharge and hospital avoidance support program provided by peers. Recipients of peer support (n=49) 300 bed days and costs were saved by the peer service. Sells et al. 2006; 2008 [18, 19] Intensive case-management teams that included peer providers. Recipients of case management (n=137) Participants who received peer-based services felt that their providers communicated in ways that were more validating and reported more positive provider relationship qualities compared with participants in the control condition. Griswold et al. 2010  Trained peers employed by a local community organization provide a variety of services, including connections to social and rehabilitation services, by arranging appointments and providing transport. Recipients of psychiatric emergency care (n=175) Participants with peer support were significantly more likely to make connections to primary medical care. Yanos et al. 2001  Programs that are staffed and operated completely by self-described mental health consumers provide services such as self-help, activity groups, and drop-in groups. Recipients of mental health services (n=60) Involvement in self-help services was associated with better community adjustment, the use of more coping strategies, and a greater proportion of problem-centered coping strategies. Corrigan 2006  Consumer-operated services. People with psychiatric disability (n=1824) Participation in peer support was positively correlated with recovery or empowerment factors. Nelson et al. 2007  Consumer / survivor initiatives run by and for people with mental illness. Participants of peer-run organization (n=102) Continuously active participants scored significantly higher on a measure of community integration than the non-active group. Galanter 1988  Self-help program designed by a psychiatrist to help participants cope with general psychiatric disorders. Participants in self-help group (n=356) A decline was found in both symptoms and concomitant psychiatric treatment after subjects joined the self-help group. Wilson et al. 1999  Peer group work, including welcoming members, check-in, group discussion, planning a recreational outing and check-out or closure. Participants in peer support groups (n=165) Maintained independent or semi-independent living, an increase in the use of community resources and an increase in the size of the social support network. Segal & Silverman 2002  Self-help agencies that offer mutual support groups, drop-in space, and direct services, including case management, peer counseling, housing, financial benefits, job counseling, information and referral. Long-term users of self-help agencies (n=255) The participants showed significant improvement in personal empowerment, a significant decrease in assisted social functioning, and no significant change in independent social functioning. Bracke et al. 2008  Peer groups of clients of day-activity programs of rehabilitation centers for persons with chronic mental health problems. Users of vocational and psychiatric rehabilitation centers (n=628) The effects on self-esteem and self-efficacy of the balance between providing and receiving support in the peer groups were evaluated. The results showed that providing peer support is more beneficial than receiving it. Castelein et al. 2008  A closed peer-support group discussing daily life experiences. The group has 16 90-minute sessions biweekly over 8 months. Users of healthcare centers (n=106) Peer support groups had a positive effect on social network and social support compared with the control condition. Armstrong et al. 1995  Satisfaction, QOL and personal development benefits regarding the consumer volunteer program. Consumer volunteers (n=23). Semi-structured individual interviews. Participants emphasized their relationship as empathetic human beings and reciprocal relationships. Through their changed sense of identity, they experienced positive changes in QOL. Mowbray et al. 1996  Roles, benefits, challenges, structure and personal issues of peer specialists. Peer support specialists who completed the training (n=11). Focus group interviews. Consumers as community support workers can make distinctive contributions to the support of their peers within the community and on the jobsite. Mowbray et al. 1998  Benefits and problems of consumers as peer support specialists. Former peer support specialists (n=11). Semi-structured individual interviews. Many benefits accrue to the peer-support specialists, but benefits identified for the mental health system appeared to be more limited, at least according to the PSS perspective. Yuen & Fossey 2003  Rewards and challenges of working in recreation program. Consumer-staff employed (n=3). Semi-structured individual interviews. Rewards were purposeful activity, wages, social networks, helping others, sense of teamness and maintaining well-being. Challenges were negative feelings about the team process. Doherty et al. 2004  Benefits and problems of having a consumer-employee within an assertive outreach team. Consumer employees (n=2) and other team members (n=10). Semi-structured interviews. Benefits were increased self-esteem, hope, a positive role model and changes in staffs attitudes towards the clients. The drawback was the high incidence of sick leave. Gates & Akabas 2007  Policies, procedures and structures that support the contribution of peers. Mental health agency staff (n=93) and peer providers (n=15). Semi-structured telephone interviews and focus groups. Respondents identified attitudes toward recovery, role conflict, lack of policies and practices around confidentiality, poorly defined job structure and lack of support for peer providers. Chinman et al. 2008  Experiences in joining a team and the duties, roles and barriers of consumer-providers. Consumer-providers (n=59) and supervisors (n=34). Focus group interviews. Consumer-providers provide a wide range of recovery-oriented services and are valued by staff and consumers. Moll et al. 2009  Issues and challenges associated with integrating peer-support services into “traditional” mental health services. Peer support workers (n=6) and managers (n=6). An in-depth, semi-structured interview. Central challenges included defining and establishing roles, balancing tensions between the peer and staff roles, negotiating the challenges of being a role model, transitioning identity from consumer to provider and fitting in or being accepted in the workplace. The reviewed studies were divided into three categories: peer employees (peer specialists), peer-run or peer-operated services and mutual-help groups (self-help groups). This simplified categorization was based on Solomon’s study . Table 2 summarizes the details of the quantitative evaluation of peer support. Nine studies examined the outcome of peer employees or peer-support specialists. Subjective quality of life (QOL), number of life problems experienced, educational and employment preparedness and social contacts were used as outcome measures [18-27]. Four studies focused on peer-led or peer-run programs and evaluated recovery using the Recovery Assessment Scale (RAS), empowerment, continuity of care, QOL, symptom distress, number of coping strategies, social functioning and rate of re-hospitalization [15, 28-30]. Five studies examined mutual-help groups or self-help groups. Social network, self-efficacy, self-esteem, QOL, economic consequences, hospitalization rate, recovery attitude, empowerment, social functioning and general life satisfaction were evaluated as outcomes [14, 31-34]. Although most of these studies focused on outcomes for those receiving peer support, some qualitative studies have reported benefits for peer support providers, as mentioned below. Researches on peer-run and peer-operated services reported not only benefits of service use, but benefits and meanings of those environments or being a member of those organizations [35-37]. Regarding mutual-help groups or self-help groups, all of the studies [14, 31-34, 38] examined the outcomes for participants of peer-support groups because there is usually no clear distinction between the providers and the recipients of peer support in mutual-help groups. As Solomon and Draine  pointed out, people working in peer-operated services and peer employees provide services to others; benefits for themselves from their work are secondary. In contrast, people in mutual-help groups expect mutual benefit and are unpaid. We included the three categories of peer support to review the effects of receiving and providing peer support regardless of payment. As mentioned above, the effects of receiving peer support are broad and include not only clinical effects, such as QOL or the hospitalization rate, but also personal and emotional effects, such as feelings of understanding or trust. Many studies reported the importance of peers as positive role models of recovery for consumers, carers and staff [27, 39, 40]. Many users and patients felt respect, humanity, trust and related to consumer-providers more readily than traditional staff, which facilitated user/patient engagement and satisfaction [35, 41]. Consumer-providers empowered patients to be more outspoken about pursuing their own goals . Mowbray et al. pointed out that one important element of peer support is a personal understanding of the frustrations with the mental health system experienced by many consumers . In addition to the benefits of peer support for recipients, some research has focused on the benefits to peer-support providers. Providers’ benefits include self-efficacy resulting from the experience of helping others, increased self-knowledge due to the communication among people sharing common experiences and the development of skills through human service work experiences. The helper-therapy principle is the therapeutic effect for both people in a "helper" and "helpee" relationship . An opportunity to contribute to the recovery of others also contributes to providers’ own recovery [27, 44]. Peer-support providers noted that the benefits of peer support are personal growth (specifically, increased knowledge about oneself), initiative and perseverance. Growth came about from sensitivity to the emotional states of clients, fulfilling commitments and acknowledging and learning from mistakes. They also described the development of specific skills and talents, improved communication abilities and increased confidence [27, 40, 42, 45]. Some providers said that one of the most rewarding aspects was when a peer support recipient said that he or she enjoyed the time spent with the peer support provider . Peer support providers experienced many positive changes in their lives, such as helping them to avoid being “withdrawn,” “regaining confidence” and gaining “a sense of identity” and the “approval of others” [46-48]. Many peer-support providers mentioned the very important and concrete benefit of earning money [42, 45]. Although payment status did not affect peer support satisfaction, it was associated with more positive recovery attitudes, spirituality and engagement in meaningful activities . Peer support provided benefits for its recipients and providers as well as for other people, such as colleagues of peer-support providers. When peer-support providers join the mental health service team, they help the entire team become more patient centered or recovery oriented and they promote understanding about consumers [9, 27, 39]. Peer-support providers are often seen as role models for patients and traditional staff, and they encourage both groups to be optimistic and action oriented toward recovery . The mixed peer and employee role allows peer-support providers to act as liaisons between the staff and patients, helping each to better understand the other [41, 50, 51]. Benefits to the larger mental health system were also reported. There is significant potential for encouraging mental health service culture and practice towards a greater focus on recovery, interpersonal relationships and improved collaboration [9, 27, 52]. Peer-support providers positively influence attitudes toward the abilities of persons with mental illness, effectively breaking down stigmas . Eight qualitative studies investigated the perceived positive effects and challenges of working as a peer-support provider (Table 3). Positive effects were also examined in quantitative studies, but challenges in working as a peer were most apparent in qualitative studies. Perhaps because there is no clear distinction between the providers and the recipients of peer support in mutual-help groups, no studies have reported on the challenges in “providing” peer support in mutual-help groups. Numerous studies have shown that peer-support providers find the transition from “patient” to “staff/provider” challenging [41, 50, 51]. Non-peer staff may become overly concerned about the peer staff becoming symptomatic, especially if they work at the same facility from which they have received or are currently receiving services [39, 41, 50]. Notably, peer-support providers’ difficulties separating mental health issues from work-related issues were reported not only by peer staff but also by non-peer staff [41, 50]. There may be tensions between the peer role and the staff role, such as peer-support providers being unwilling to give up their unique perspective as consumers to adopt professional beliefs and roles . Role conflict was also seen in peer-run organizations as value dilemma regarding the role of paid consumer staff member . These conflicts were closely related to boundary issues. Boundary issues were commonly observed in studies that investigated the experiences of peer-support providers [40-42, 50, 51]. A typical boundary topic was whether to relate to service users as friends or clients. Friendships, casual relationships, or relationships involving personal feelings tend to be seen as unprofessional and unethical in traditional service-provider settings [42, 50]. At times, however, peer-support providers have chosen not to share information about clients with agency staff for fear of violating the trust they believed was important to their friendship with the client . Disclosure of peer status was perceived as a key factor that affected peer integration. Peer-support providers who were open and who disclosed their own experiences were able to build trust with clients and serve as role models for recovery. However, peer-support providers sometimes felt vulnerable or reluctant to disclose their own experiences or personal information [41, 48, 50, 53]. Issues related to disclosure include titles for the staff. Gates and Akabas noted that the titles fell into two categories: those that identified the peers (e.g., Peer Specialist, Peer Advocate) and those that were generic (e.g., Staff Generalist, Program Aide) . Many studies mentioned that peer-support providers found their role ambiguous, and staff members, including administrators, were unsure of the role of the peer-support staff members [41, 42, 50, 51, 54]. This situation made peer-support providers anxious about demonstrating their value and led to a lack of support and guidance from supervisors and administrators because the role was not clearly defined. A number of studies reported that peer-support providers claimed to be poorly compensated [40-42, 50]. Low pay rates posed difficulties for peer-support providers who wanted jobs with sufficient compensation to emancipate themselves from disability income . This low compensation suggested to them that the peer staff role was new or was not fully valued or that the position’s role in the agency was unclear . Some of the issues regarding low compensation came from differences in working hours and the payment system (hourly versus salaried) , but this was not only the reason for low income. One of the reasons for low compensation was the difference in the compensation system for peer and non-peer staff. For example, non-peer staff would be given preferential pay if the staff member has certification as a social worker, but peer staff would not because certification is ‘not part of the job requirement’ for peer staff . Another reason for the different compensation systems might be that while some non-peer staff members felt that peers “made the concept of recovery real,” there was a persistent stigma among other non-peer staff members with respect to the capacity for people with mental health conditions to work . Limited hours of work for peer-support providers led to another challenge: there was little time to interact with other non-peer staff members in either formal or informal settings . Furthermore, fluctuating pay resulting from the hourly (versus salaried) nature of the job created problems. For example, clients missed appointments or could not be contacted . In this review, we summarized the benefits of peer support for recipients of peer support, providers of peer support and others working with peer support, as well as the challenges for peer-support providers in the system. Numerous articles reported the positive effects of peer support in both quantitative and qualitative studies. In quantitative studies, the outcomes were measured by psychiatric indicators, such as symptom severity and admission rates, or by socio-psychological indicators, such as QOL, empowerment and recovery measurements. Most of the qualitative studies mentioned enhanced recovery in individuals or enhanced recovery attitudes in groups. As Dixon et al. noted, peer-support programs often focus on outcomes that have not been traditionally valued or assessed in standard clinical trials . Thus, qualitative studies are a great help in determining the real value of peer support. Perceived challenges from the perspectives of the peer-support providers and colleagues were found in the qualitative studies we reviewed. Most of the challenges were related to “role” and “relationship” issues. Role conflict, boundaries, disclosure of peer status, role ambiguity and low compensation were affected by how peer-support providers relate to recipients of peer support and how peer-support providers are treated in the system. With regard to role ambiguity, when a new type of occupation is established in an existing organization, role ambiguity may be perceived among the newcomers and their colleagues. Trial and error is required to determine what type of structure and service are most effective for the organization and its clients. As Carlson et al. pointed out, facilitating dialogue and discussion about roles with all people involved is a key strategy. This situation may also be necessary for the establishment of peer-support providers. However, role conflicts and boundary issues may be challenges specific to peer support because of the biased view of the helper-helpee relationship, which results from conventions and assumptions that people in the service system are divided into the roles of traditional helpers or helpees and must be treated according to these roles. We must consider whether traditional helper-helpee relationships are best for service users. Service users know what types of relationships are most effective for them. It is critical for health-care professionals to learn from service users for the mental health system to progress. Most peer-support providers have experiences of service use, and health-care professionals have much to learn from peer support. To appreciate the true value of peer support, however, we must extend our view beyond the traditional ways of thinking about help and support. In redefining the idea of help and support, the knowledge drawn from peer-support relationships can be beneficial. Based on narrative inquiries, MacNeil and Mead  identified seven standards that reflect and characterize the ideal peer-support relationship. They conducted interviews on the topic “what makes for good peer support” with peer-support receivers and providers at a peer-support center within a traditional mental health system. They identified the following standards for the helping process: ‘Critical learning and the renaming of experiences are promoted,’ ‘Sense of community,’ ‘Great flexibility in the kinds of support provided,’ ‘Activities, meetings, and conversations are instructive,’ ‘Mutual responsibility across relationships,’ ‘Clarity about setting limits’ and ‘Sophisticated levels of safety.’ Anthony  identified the characteristics of helping partners as ‘Caring and respectful communication,’ ‘Resourcefulness,’ ‘Patience and recovery orientation,’ ‘Knowledgeable teacher’ and ‘Interdependence.’ Ideas of mutual responsibility and interdependence may be new to the traditional helper-helpee relationship, but these concepts may provide insight on the mental health msystem. Future studies should investigate the ideal helping relationship by including the diverse aspects of the peer-support relationship. Relationships are interactive and impermanent. However, the relationship established between patients and health-care providers is often directive and irreversible. Once a person is treated as a patient and treats himself/herself as a patient, it is difficult to overcome this helper-helpee relationship. Peer support has great potential to prevent a helper-helpee relationship from being rigid and perpetuating the patient’s role. This research was partially supported by the Ministry of Education, Science, Sports and Culture, Grant-in-Aid for Young Scientists (A), 22689056, 2010-2013. Work on this article was also supported by the Mitsubishi Foundation, Grants for Social Welfare Activities, 2010. Mead S, Copeland ME. What recovery means to us consumers' perspectives Commun Ment Health J 2000; 36(3): 315-28. Davidson L, Chinman M, Sells D. Peer support among adults with serious mental illness a report from the field Schizophr Bull 2006; 32(3): 443-50. Solomon P. Peer support/peer provided services underlying processes benefits and critical ingredients Psychiatr Rehabil J 2004; 27(4): 392-401. Pistrang N, Barker C, Humphreys K. Mutual help groups for mental health problems a review of effectiveness studies Am J Commun Psychol 2008; 42(1): 110-21. Cook JA, Copeland ME, Hamilton MM. Initial outcomes of a mental illness self-management program based on wellness recovery action planning Psychiatr Serv 2009; 60(2): 246-9. Druss BG, Zhao L, von Esenwein SA. The Health and Recovery Peer (HARP) Program a peer-led intervention to improve medical self-management for persons with serious mental illness Schizophr Res 2010; 118(1-3): 264-70. Fukui S, Davidson LJ, Holter MC. Pathways to recovery (PTR): impact of peer-led group participation on mental health recovery outcomes Psychiatr Rehabil J 2010; 34(1): 42-8. Solomon P, Draine J. Consumers as providers in psychiatric rehabilitation New Dir Ment Health Serv 1998; (79): 65-77. Solomon P, Draine J. The state of knowledge of the effectiveness of consumer provided services Psychiatr Rehabil J 2001; 25(1): 20-7. Davidson L, Chinman M, Kloos B. Peer support among individuals with severe mental illness a review of the evidence Clin Psychol SCI PR 1999; 6(2): 165-87. Ayers TD. Dimensions and characteristics of lay helping Am J Orthopsychiatry 1989; 59(2): 215-5. Adame AL, Leitner LM. Breaking out of the mainstream The evolution of peer support alternatives to the mental health system Ethical Hum Psychol Psychiat Int J Crit Inquiry 2008; 10(3): 146-62. Castelein S, Bruggeman R, van Busschbach JT. The effectiveness of peer support groups in psychosis A randomized controlled trial Acta Psychiatr Scand 2008; 118(1): 64-72. Chinman MJ, Weingarten R, Stayner D. Chronicity reconsidered improving person-environment fit through a consumer-run service Commun Ment Health J 2001; 37(3): 215-9. Hodges JQ. Peer support among consumers of professional mental health services Implications for practice policy and research J Hum Behav Soc Environ 2007; 4(3): 1-92. Lucksted A, McNulty K, Brayboy L, et al. Initial evaluation of the Peer-to-Peer program Psychiatr Serv 2009; 60(2): 250-3. Sells D, Black R, Davidson L, et al. Beyond generic support incidence and impact of invalidation in peer services for clients with severe mental illness Psychiatr Serv 2008; 59(11): 1322-7. Sells D, Davidson L, Jewell C, et al. The treatment relationship in peer-based and regular case management for clients with severe mental illness Psychiatr Serv 2006; 57(8): 1179-84. Solomon P, Draine J. The efficacy of a consumer case management team: 2-year outcomes of a randomized trial J Mental Health Admin 1995; 22(2): 135-46. Solomon P, Draine J. Satisfaction with mental health treatment in a randomized trial of consumer case management J Nervous Mental Dis 1994; 182(3): 179-84. Solomon P, Draine J, Delaney MA. The working alliance and consumer case management J Mental Health Admin 1995; 22(2): 126-34. Felton CJ, Stastny P, Shern DL, et al. Consumers as peer specialists on intensive case management teams impact on client outcomes Psychiatr Serv 1995; 46(10): 1037-44. Gammonley D, Luken K. Peer education and advocacy through recreation and leadership Psychiat Rehabil J 2001; 25(2): 170-8. Griswold KS, Pastore PA, Homish GG, et al. Access to primary care: are mental health peers effective in helping patients after a psychiatric emergency? Pri Psychiat 2010; 17(6): 42-5. Rivera JJ, Sullivan AM, Valenti SS. Adding consumerproviders to intensive case management: does it improve outcome? Psychiatr Serv 2007; 58(6): 802-9. Lawn S, Smith A, Hunter K. Mental health peer support for hospital avoidance and early discharge n Australian example of consumer driven and operated service J Mental Health 2008; 17(5): 498-508. Yanos PT, Primavera LH, Knight EL. Consumer-run service participation recovery of social functioning and the mediating role of psychological factors Psychiatr Serv 2001; 52(4): 93-500. Corrigan PW. Impact of consumer-operated services on empowerment and recovery of people with psychiatric disabilities Psychiatr Serv 2006; 57(10): 1493-6. Nelson G, Ochocka J, Janzen R, et al. A longitudinal study of mental health consumer/survivor initiatives Part V-Outcomes at 3-year follow-up J Commun Psychol 2007; 35(5): 655-. Galanter M. Zealous self-help groups as adjuncts to psychiatric treatment: a study of Recovery, Inc Am J Psychiatr 1988; 145(10): 1248-53. Wilson ME, Flanagan S, Rynders C. The FRIENDS program A peer support group model for individuals with a psychiatric disability Psychiatr rehabil J 1999; 22(3): 239-47. Segal SP, Silverman C. Determinants of client outcomes in self-help agencies Psychiatr Serv 2002; 53(3): 304-9. Bracke P, Christiaens W, Verhaeghe M. Self-esteem selfefficacy and the balance of peer support among persons with chronic mental health problems J Appl Soc Psychol 2008; 38(2 ): 436-59. Hardiman ER. Networks of caring: a qualitative study of social support in consumer-run mental health agencies Qualitative Soc Work 2004; 3(4): 431-8. Mowbray CT, Tan C. Consumer-operated drop-in centers evaluation of operations and impact J Mental Health Admin 1993; 20(1): 8-19. Nelson G, Janzen R, Trainor J, et al. Putting values into practice public policy and the future of mental health consumerrun organizations Am J Commun Psychol 2008; 42(1-2): 192-201. Resnick SG, Armstrong M, Sperrazza M, et al. A model of consumer-provider partnership: Vet-to-Vet Psychiat Rehabil J 2004; 28(2): 185-7. Doherty I, Craig T, Attafua G, et al. The consumer-employee as a member of a mental health assertive outreach team II Impressions of consumer-employees and other team members J Mental Health 2004; 13(1): 71-81. Mowbray CT, Moxley DP, Thrasher S, et al. Consumers as community support providers issues created by role innovation Commun Ment Health J 1996; 32(1): 47-67. Chinman M, Lucksted A, Gresen R, et al. Early experiences of employing consumer-providers in the VA Psychiatr Serv 2008; 59(11): 1315-21. Mowbray CT, Moxley DP, Collins ME. Consumers as mental health providers first-person accounts of benefits and limitations J Behav Health Serv Res 1998; 25(4): 397-411. Schutt RK, Rogers ES. Empowerment and peer support Structure and a process of self-help in a consumer-run center for individuals with mental illness J Commun Psychol 2009; 37(6): 697-710. Anthony WA, Ashcraft L. From consumer to caregiver. Individuals and systems benefit from use of peer-support models Behav Healthc 2006; 26(1): 10-. Yuen MSK, Fossey EM. Working in a community recreation program a study of consumer-staff perspectives Aust Occup Ther J 2003; 50(2): 54-63. Armstrong ML, Korba AM, Emard R. Of mutual benefit: The reciprocal relationship between consumer volunteers and the clients they serve Psychiat Rehabil J 1995; 19(2): 45-9. Salzer MS, Shear SL. Identifying consumer-provider benefits in evaluations of consumer-delivered services Psychiatr Rehabil J 2002; 25(3): 281-8. Yarek C. Ethics in peer support work J Ethics Ment Health 2008; 3(1): 1-3. Barber JA, Rosenheck RA, Armstrong M, et al. Monitoring the dissemination of peer support in the VA Healthcare System Commun Ment Health J 2008; 44(6): 433-1. Gates LB, Akabas SH. Developing strategies to integrate peer providers into the sta ff of mental health agencies Adm Policy Ment Health May 2007; 34(3): 293-306. Moll S, Holmes J, Geronimo J. Work transitions for peer support providers in traditional mental health programs: unique challenges and opportunities Work 2009; 33(4): 449-58. Paulson R, Herinckx H, Demmler J. Comparing practice patterns of consumer and non-consumer mental health service providers Commun Ment Health J 1999; 35(3): 251-69. Read S, Rickwood DJ. Volunteering as a community mental health educator Positives and negatives for recovery Aust e-J Adv Men Health 2009; 8(2): 1-10. Solomon P, Draine J. Perspectives concerning consumers as case managers Commun Ment Health J 1996; 32(1): 41-6. Dixon LB, Dickerson F, Bellack AS, et al. The 2009 schizophrenia PORT psychosocial treatment recommendations and summary statements Schizophr Bull 2010; 36(1): 48-70. Carlson LS, Rapp CA, McDiarmid D. Hiring consumerproviders: barriers and alternative solutions Commun Ment Health J 2001; 37(3): 199-213. MacNeil C, Mead S. A narrative approach to developing standards for trauma-informed peer support Am J Evaluat 2005; 26(2): 231-44. Anthony KH. Helping partnerships that facilitate recovery from severe mental illness J Psychosoc Nurs Ment Health Serv 24-8 2008; 46(7): 9-33.